Fischer is accompanied by her father Adam, who sits alongside her during matches. But during the game, he mostly waits in the wings, only stepping in to help shuffle and draw cards. When she plays them, she’s beating opponents triple her age or older. 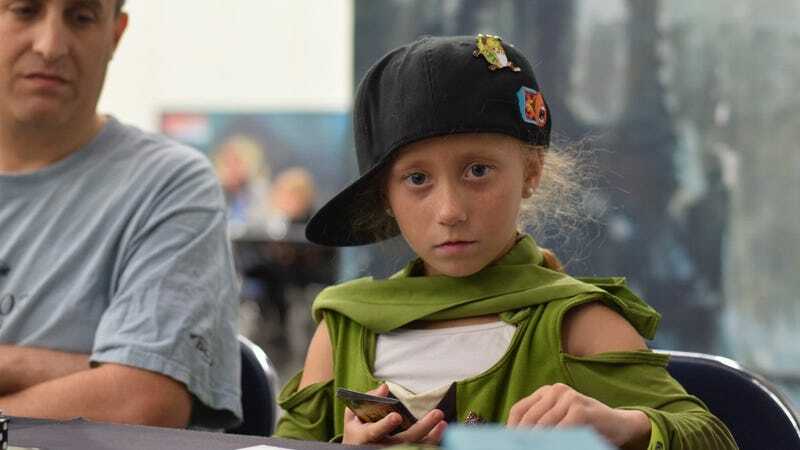 Her finish earned her a bye at the upcoming Oklahoma City event. She needed only four wins to get the bye, but she got five anyways, a detail she was happy to point out in a live interview. Dana Fischer is a late entry and a strong candidate for sports child of the year, prodigy division. According to the Magic commentators on Twitch, Dana’s hands are not quite big enough to shuffle. But she’s practicing her shuffling, so she’ll be beating adult opponents without her dad by her side soon enough. IS SEVEN A SPORTS BABY?